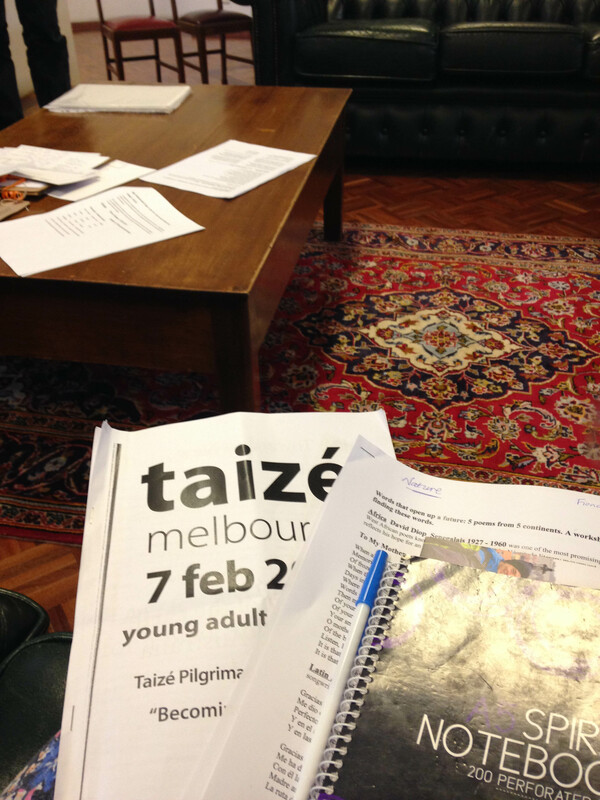 In February 2015 I was very privileged to participate in the Melbourne Taizé Pilgrimage Day. Three of the monks from the Taizé community in France spent the whole day with a group of about 100-150 young adults. Taizé is an incredible ecumenical form of Christian prayer and worship, incorporating elements from a number of different liturgical traditions. 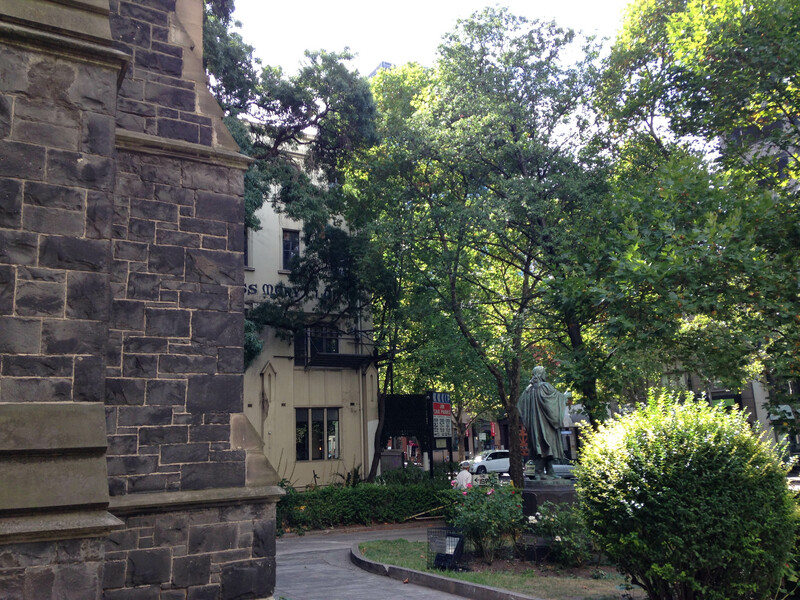 We travelled to three churches – Uniting, Catholic and Anglican – as well as spending part of the day at a series of workshops at Melbourne University (I think it was Melbourne Uni, it was all a blur and I don’t quite recall!). My husband and I were probably the only representatives from a Pentecostal church – probably because Pentecostalism is a very far cry from the contemplative and meditative styles of Christianity that incorporate iconography and lectio divina. However for me, a Catholic for most of my life, it was a fantastic time of reconnecting with the faith tradition I was raised in. There was a beautiful and strong emphasis on diversity of Christian tradition and ethnicity and culture. It was a very multicultural crowd. We were Welcomed to Country by an Australian Indigenous elder at the first service. The deliberate efforts towards peace and reconciliation between different people groups is so inspiring. In the morning Bible study session I found it fascinating that even though our group was so diverse in tradition and ethnic background, we were able to share freely from the common ground of our faith in Christ. When you spend such an intensive day with believers from very diverse traditions and language groups and eat together and read the Bible together, it’s a profound experience of realising that “Others” are really fellow pilgrims and travellers in this journey of life. I attended a poetry reading and writing workshop, and a discerning God’s will through Bible study and prayer workshop, both run by the Taizé monks. What I learned there could last me a lifetime. At times the day felt like being part of a Christian flashmob. We turned up at the Catholic Church, St Francis’s – the oldest Catholic Church in the state of Victoria – around the time of day that worshippers were spending time in quiet reflection before the Sacrament. I wish I knew what it must’ve looked like to the unsuspecting congregants when a large group of young adults swarmed in, seated ourselves at the front pews, and burst into song, singing the beautiful Taizé hymn “Bless the Lord.” Of course, it took us a while to get to our venue because in a group of Christians walking around the city together, where a number of the group members were monks, priests and nuns, the religious kept kneeling down to say hello to the homeless people we met along the way. It was a learning experience for me, to realise that I might have not noticed the homeless on the street in my rush to get to the next destination, but for the monks and nuns no schedule was more important than stopping to recognise the humanity of these men on the roadside. This video shows some highlights from the component of the day spent at St Paul’s Anglican Cathedral in Melbourne, a wonderful iconic building across the road from the famous Flinders Street Station clocks and Federation Square, in the heart of our beautiful city. I appear briefly in the blurry background of the video – I was sitting on the floor near the altar. I remember that my voice was tired from a lot of hymn singing, I had a throbbing headache and my legs were sore from all the walking and kneeling. But when it was my turn to walk across to the icon of the Crucifixion and pray, using the art and symbolism to remind me of Jesus Himself, it was just an incredibly powerful spiritual moment, like water welling up from a deep spring – it’s something I will probably never be able to explain in a way that does it justice. 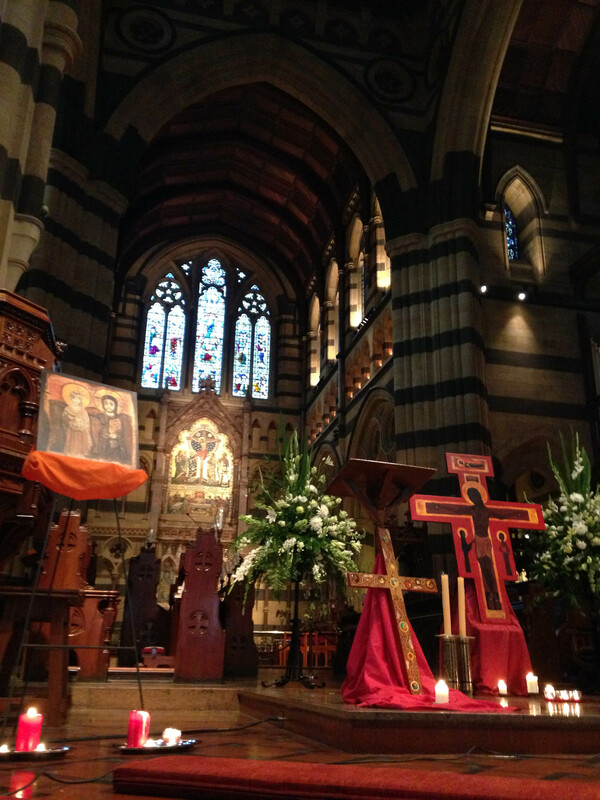 As I walked out of the Cathedral that night, farewelling newly-made friends and watching the skies darken over the city, I was reminded of the beauty of the mystery of our faith. When I rediscover the sense of awe and mystery it’s no longer a faith to be deconstructed and proven in a catechismal apologetic; instead there’s a peace and joy from the sharing of faith community, as well as a strengthening of the inward self that has learned to be comfortable with the unexplainable beauty of silence and contemplation. We have also attended a couple of the local Taizé-style worship services in the last year – one at a Lutheran Church and one at a Uniting Church – and we look forward to attending as many as we can before we reach the 35-year-old cut-off age (noooooo! Maybe I’ll just pretend I’m perpetually early-30s). For my lifelong Pentecostal husband it seems to have revealed to him new ways of praying and understanding the Bible. He was raised in a context where he was taught that liturgical Christians are not really Christian, and so it’s been helpful for him to break down some of those deeply ingrained prejudices and discover the faith he shares in common with different styles of Jesus following. In the silence I love watching the flickering flames, meditating on the iconography, contemplating the beauty of the different churches we sat in. I also love the way it provides a safe space for Christians from different traditions to acknowledge our shared faith as well as our differences. Possibly the most famous aspect of Taizé is their music, beautiful choral hymns reciting scripture passages. Often these are sung in Latin, or other languages. The group I have attended will find out in advance which language groups are represented so that they can incorporate scripture readings and songs for a diverse group. In Taizé I’ve heard the Bible read and sung in Latin, English, German, Chinese and numerous other languages as befitting our very multicultural city. 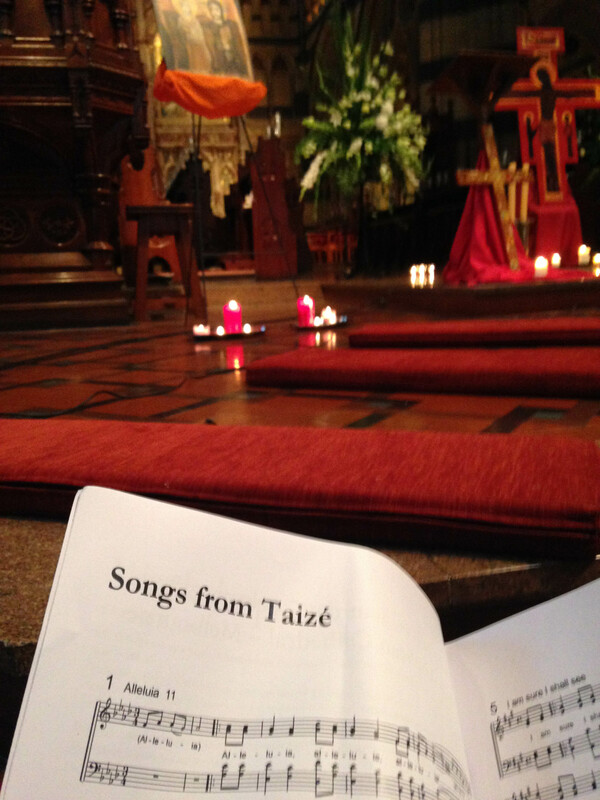 Over the coming weeks I will try to share a few videos of Taizé music. I’ve heard there is also a Taizé podcast though I haven’t tracked that down yet. If you haven’t heard of Taizé before but are curious to know more, you can visit their multilingual website taize.fr. Here are some of the snap shots I took of the Pilgrimage Day on my mobile phone camera. Posted in religion, spirituality, video and tagged anglican, australia, bible, catholic, charismatic catholic, christianity, community, contemplation, ecumenical, ecumenism, lectio divina, liturgical, lutheran, meditation, melbourne, monasticism, orthodox, peace, pentecostal, pilgrimage, reconciliation, spirituality, taizé, uniting on June 22, 2015 by Fiona. This video is part of an ongoing series of spiritual videos I’ve been sharing on this blog. The videos I’ve chosen are, most of the time, shared here because they touch on concepts like spirituality, environmentalism, Jesus and Christian mysticism. I am still exploring these ideas. Videos like this one intrigue me with their thought-provoking ideas, and the mystic way they understand the Christian scriptures. By sharing them I am not suggesting nor hinting at my own personal faith perspective, except to say that I am personally very interested in Christian environmentalism and Christian mysticism. You can see the videos I’ve shared so far HERE. Posted in video and tagged catholic, christian, nature, richard rohr, spirituality, spirituality video, video on June 7, 2015 by Fiona.